CJM News: “What does it mean to declare St John Eudes a Doctor of the Church? 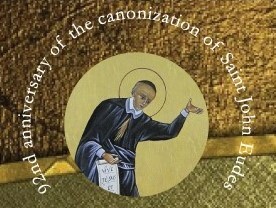 The recognition of St. John Eudes as a Doctor of the Church would place in the mainstream the valuable school of French spirituality which has exercised a significant influence on the Church since the 17th century to this day and, in particular, on priestly formation, religious congregations that sprang from this tradition, and the role of the laity in the Church. The life, witness, writings and legacy of St. John Eudes are relevant to the new evangelization and the renewal of baptismal life. Furthermore, we find that what St. John Eudes preached and wrote in his day is consonant with the texts of Vatican Council II, the Catholic Catechism, the writings of St. John Paul II, and the interventions of Pope Francis. We can emphasize, in particular, the pastoral dimension of this apostle of the 17th century, the missionary engagement and the spiritual formation which were at the service of the renewal of Christian life. This is in line with the insistence of Pope Francis on the need to be “missionary disciples” (Joy of the Gospel). John Eudes lived in an inseparable manner the service of mercy, the proclamation of the Gospel, and the formation of Jesus in human hearts. We, the Eudist family, see in this process of obtaining recognition of St. John Eudes as a Doctor of the Church a great opportunity to reclaim the relevance and fruitfulness of the spiritual experience of St. John Eudes. This will certainly take time and the mobilization of the entire Eudist family. In any case, we hope to succeed.